In the early 1700’s Mark Catesby, an Englishman, traveled to the American colonies to paint the flora and fauna of the new world. During two visits to the Colonies he went into the field and drew images of the birds, animals, fish and insects he found. After his return to England, he published a color plate book entitled THE NATURAL HISTORY OF CAROLINA, FLORIDA AND THE BAHAMA ISLANDS, 1731-43. This book represented the first work depicting the natural wonders of the new world. In so doing, Catesby now ranks as the greatest natural history artist of the 18 th Century. The achievements of Catesby rise above that of all other naturalists of this period. Under difficult conditions, using Indians as guides and constantly endangering his life, he persisted in searching the Eastern regions of America and the Bahamas. Once back in England, he undertook the monumental task of publishing his work - etching and coloring the plates himself, as well as selling the NATURAL HISTORY. Throughout the 20 years he worked painting, describing and etching 220 copper plates, his success as a publisher rivaled his accomplishments in the field. His text offered a window into the natural wonders of the new world and proved as important as his images of the flora and fauna. This beautiful book included two volumes and an appendix, the first volume showing bird images and the second fish, animals, insects and plants. 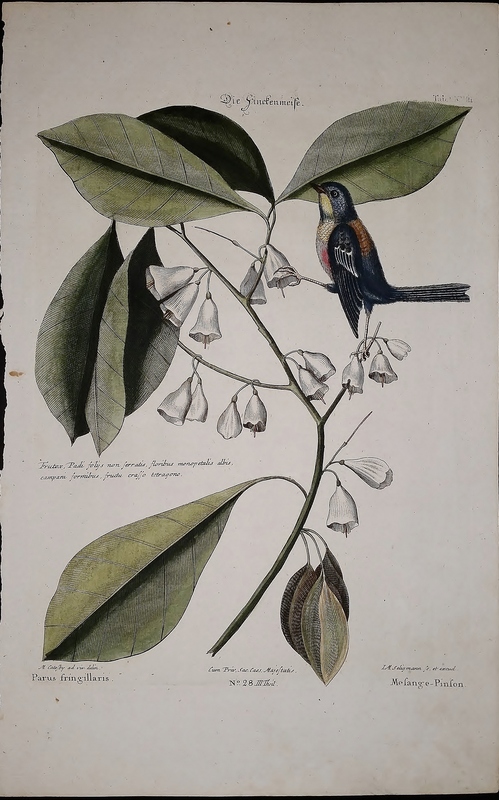 As an illustrated nature study of American plants and animals, Catesby’s work provided insight to future ornithologists such as Alexander Wilson and John Audubon. Wilson’s and Audubon’s work followed almost 100 years after Catesby’s NATURAL HISTORY. Neither man faced the hazards met by Catesby, whose knowledge as a scientist, explorer and biologist placed him at the forefront of the discovery of the natural history treasures of what was to become North America. Several English editions were printed later in the 1700's and European engravers re-etched his plates and issued volumes in French, German and Dutch. In the English Edition, the engraved, hand-colored plates measure about 14 x 20 inches and are some of the rarest prints in our inventory. Those offered below are from the editions in the 1700’s unless otherwise noted. The European Edition of Mark Catesby's Natural History began in 1749 as engravers in Europe moved to meet the demand on the continent for prints of the New World's birds, animals and plants. Johann Seligmann, an outstanding artist in Nuremberg, Germany, began issuing a work which drew from the English productions of Catesby's NATURAL HISTORY and George Edward's A NATURAL HISTORY OF UNCOMMON BIRDS. The bird prints issued earlier by Catesby and Edwards were re-etched by Seligmann in a smaller format (10 x 15 inches) and interspersed in the new books. On completion of Volume 4 Seligmann had re-etched all of Catesby's Volume I of 100 bird prints as well as the Appendix. Seligmann's engravings often added small background scenes but the bird etchings were unchanged. Catesby or Edwards were credited in each plate as the original artist and the print legend was in Latin, French and German. The total work covered 7 volumes and 473 plates, most of which were re-etchings of Edwards’ birds. Meanwhile, other European engravers were reproducing Volume II of the animals, fish, insects and plants. A Second Edition of the 1749 European Edition of the birds, using the same engravings, was issued in 1777, and were soon followed by French and Dutch editions. The work helped meet the cravings in Europe for knowledge about the natural history of the New World. At the same time, it spread Catesby's fame as an artist, pioneer, explorer, and scientist throughout the continent as many considered this work by Seligmann as one of the most beautiful ornithological books of the 18th Century. Over the years the focus on Catesby has rightly centered on the three English Editions, but he had a continental audience as well. Although circulated throughout Europe over 200 years ago, and losses resulted from two World Wars, a small number of these prints remain. These prints offer to the collector an opportunity to own a piece of the art which spread Catesby’s fame across Europe and rightfully enlarged his place as the first delineator of the natural curiosities of North America.